Papercutter, illustrator, animator. Lover of intricate details, pattern and the wonderful complexity of natural forms. The last year has seen a lot of exciting changes happen in my work. My practice has become more diverse, not only including papercutting but now also illustration, paper sculpture, book making and publications. In December 2018 I was commissioned by the organisation Artspace to create a book approaching my home town Ulverston as though I was an explorer. From this I created ‘Tiny Voyages Of Discovery’ which is an exploration of the stories and wildlife from Sir John Barrow Cottage to the Irish Sea – my first book which has given me many ideas for more! I’ll be leaving this website up for a few months while I finish transferring things over, but I hope you’ll come and join me while I take these new exciting steps! I’m so happy that I am once again exhibiting at The Coach House Cafe, Ford Park, Ulverston. I’ll be exhibiting original papercuts, relief prints and laser-engraved wooden blocks from 05.01.18 – 31.03.18, all exploring the diversity of life in the oceans. I’m delighted to share that I am exhibiting at Brockhole, The Lake District Visitor Centre in Windermere, Cumbria. Running for three months from Thursday 30th November until Wednesday 28th February, I’ll be showing my work in the beautiful Gaddam Gallery of the Arts and Crafts building. For the exhibition I will be exploring the ecology of Brockhole including it’s lake and ancient woodland, creating new work including a giant papercut. I’ll also be showing the beautiful laser-etched wooden blocks I’ve collaborated on with The Light Engineering Company. Workshops will also be held throughout the exhibition, and there will be the opportunity to talk to me about my work as plan to spend some days working in the gallery. This is a wonderful opportunity for me, and I look forward to it! Get 20% off prints in my new Etsy shop! I’m so excited to share that my Etsy shop organised is now officially open for business! This is a big step for me. I know there are millions of creative people trying to sell their work online, but it is something I have been working towards for the last two years. Making the work has been very time consuming, and I feel like I had to learn so much about how to present my work in the way that felt true to me. I’m planning to share everything I learnt about this in a blog post at some point in the near future to help other artists get there work up online and out there! To celebrate this step I am offering 20% off all unmounted prints from my ‘Bird Spotting’ series* from today until Thursday 2nd June! To get your prints at this lower price just visit my Etsy shop at http://www.etsy.com/shop/storiesinpapershop and type ‘CELEBRATE’ into the coupon box. Once again, thank you so much for supporting my work, whether that is buying a print or just popping over here and reading my blog! 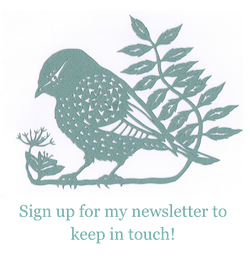 To keep informed about other offers I have coming up please sign up to my mailing list HERE . *Please note, this offer does not include papercut commissions. I would like to give away a limited edition print from my ‘Bird Spotting’ series, and the winner gets to choose which one they want! All you have to do is join the Stories in Paper mailing list by following the link below. I’ll be putting everyone’s names in a hat and filming myself picking a winner on Friday 18th December. I will put a link to the video on this page, but I’ll also contact the winner directly. The print will be sent out on Friday 18th December, or as soon I have an address to send it to! Entrants must be 18 years old or over and must be based in the UK I’m afraid. You will be able to choose any image from the ‘Bird Spotting’ series as displayed on the gallery. Your print will be a signed limited edition digital print, which fits onto a A4 sheet of paper and will come mounted on white mountboard. Please note this promotion does not have a connection with WordPress in any way and is not sponsored, supported or organised by WordPress. The recipient of the information provided by you is not WordPress, but Stories in Paper. Congratulations Katie Crutchley on being the winner of the print giveaway! 🙂 You’ve been sent an email with more information about how to claim your print! Thank you to everyone who took part and has supported my work.